One of clearest positions on the Ohio State football roster is the quarterback position, at least at the top of the depth chart. Redshirt senior J.T. Barrett will enter the 2017 season as the starting quarterback. That’s been known since the Texan announced his return for his final season. 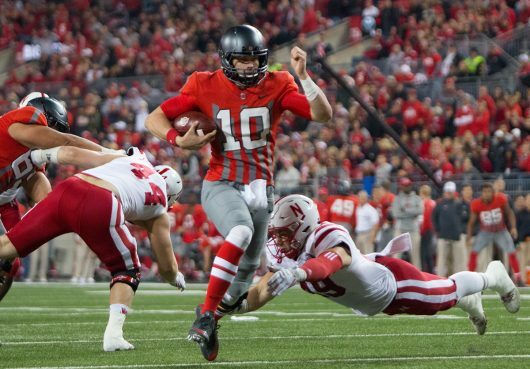 But the race to be Barrett’s backup in 2017 took place throughout the 2016 season between then-redshirt freshman Joe Burrow and then-freshman Dwayne Haskins and only escalated when freshman Tate Martell arrived in Columbus as an early enrollee. OSU coach Urban Meyer cleared the air on Tuesday by saying that as of right now, Burrow remains the No. 2 on the quarterback depth chart. Last season, Burrow was the only other quarterback to see the field, and that was when the score was lopsided. Burrow played in six games last season, completing 22-of-28 passes for 226 yards and two touchdowns. He also carried the ball 13 times, gaining 58 yards and scoring once. Dwayne Haskins did not play and will enter 2017 as a redshirt freshman. The 6-foot-3, 215-pound Burrow — who hails from Athens, Ohio — was stepping into the backup role last fall following the departure of quarterback Cardale Jones, the poster child for the value of the backup quarterback after leading the Buckeyes in three games to claim the national championship. “The backup’s job is to be ready at any moment, and if I’m not ready then I’m not doing my job,” Burrow said during the 2016 fall camp. Burrow is more of a pocket passer than Barrett and not as dynamic with his legs. Haskins will experience his first playing time for the Scarlet and Gray in the spring game on April 15, but is said to have the best arm in the group. Martell comes to OSU as one of the most decorated high school quarterbacks in recent history — 45-0 with 113 touchdowns and nine interceptions — but remains the fourth quarterback in the room. Ryan Day, OSU’s quarterbacks coach and co-offensive coordinator, said all three are very talented, but have different abilities that define their style of play. Barrett is the starter, but any coach will say competition for a guaranteed starting job is healthy for the group. Competition for the second spot on that depth chart cannot be overstated as vital for game preparation.